Not one boss, but ten of them. That’s what freelance bookkeeping is like. And each boss has a different way of doing things: the process is different, the results they want are different, and their personalities…all unique. Add to this the fact that seven of my clients are non-profit corporations with board terms, on the average, of three years. That’s a lot of boss changes! This week, I said goodbye to a treasurer that I was looking forward to working with and what came home to me was that this work is the perfect training for aging: the ongoing series of losses that we all must face. I’m a person who likes change. Likes variety and challenge. But I’m a little daunted by the speed with which I must build these new relationships and then, just as quickly, say goodbye to them. So I am wondering what it will be like to begin losing my long term friendships… not to board turnover, but to illness and eventual death. And I see the gift in the training. It forces me to be resiliant and to be grateful. To be flexible. The difficulty is staying present with the losses. Acknowledging them. Feeling the sadness without getting lost in those feelings. 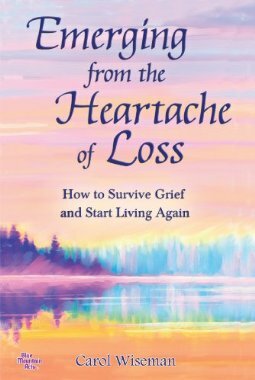 My friend Carol has written a book about healing from loss and you can find it here. Grief is not my favorite topic, but it’s an important one. Wouldn’t it be a good idea to practice in small doses before the momentum increases? Prev What am I Doing with my One Wild and Precious Life? You are, indeed, a dear. Thank you. So are you!